Are there special recipes in your family that are seriously THE BEST ever?! Those passed down from one generation to the next; one with a “secret” ingredient; or one that the whole family can’t wait to have at special occasions or certain times of the year? There are a few in our family. One is my mom’s garlic bread (so easy and soooo good) and the other is Great-Grandma’s Potato Salad! It is THE BEST! The picture for sure does not do it justice! I don’t know the history behind it or anything like that. I just know it was a staple at Easter every year and some summer events too. I remember my great-grandma (who chose to be called “big grandma” even though she was about 5’2″ and 100 pounds! 😉 ) and my grandma making it growing it up. For the last many years, my mom has taken the reigns. It’s the best potato salad I’ve ever had. YUM! This recipe makes a big ‘ole vat because that’s how we roll! No point in going to all that work if there aren’t leftovers for the family. Or, it is PERFECT to bring for a pot luck or summer BBQ party!! 2. Chop hard-boiled eggs into small dice. 3. Combine potatoes, eggs, onion, and celery in a very large bowl. Add seasonings to taste. Then add mayo, sour cream and mustard. 4. Mix carefully to not break up the potatoes too much. Use more or less of the mayo/sour cream as needed to have everything just barely coated, not excessively wet. You want it just slightly creamy, but not dripping! 😉 Make a day ahead and refrigerate overnight for better taste. Replace sour cream with light sour cream -OR- swap with plain Greek yogurt! ALWAYS use equal number of eggs to potatoes!!! If some potatoes are very large, then count 2 eggs or conversely, if some of the potatoes are as small as the eggs (like some of the Red ones) then count 1 egg per 2 tiny potatoes. The end result is absolute, creamy deliciousness…the perfect summer side for your favorite BBQ or grilled recipe!!! Seriously, yum! Now, I’m craving potato salad! I may just have to make some for 4th of July!! 😉 But, that’s not all the yummy stuff in this post! I’ve teamed up with a group of blogger friends to bring you a whole bunch of delicious summer recipes! In the list below, you’ll find more than 20 other great ideas! We’ve got you covered with drinks, desserts, sides, and more! Be sure to click around and pin your favorites…ENJOY!!! I have never made potato salad before. This recipe seems fun and I love your tips. Yum! I’m looking forward to trying this for some planned potlucks in July! 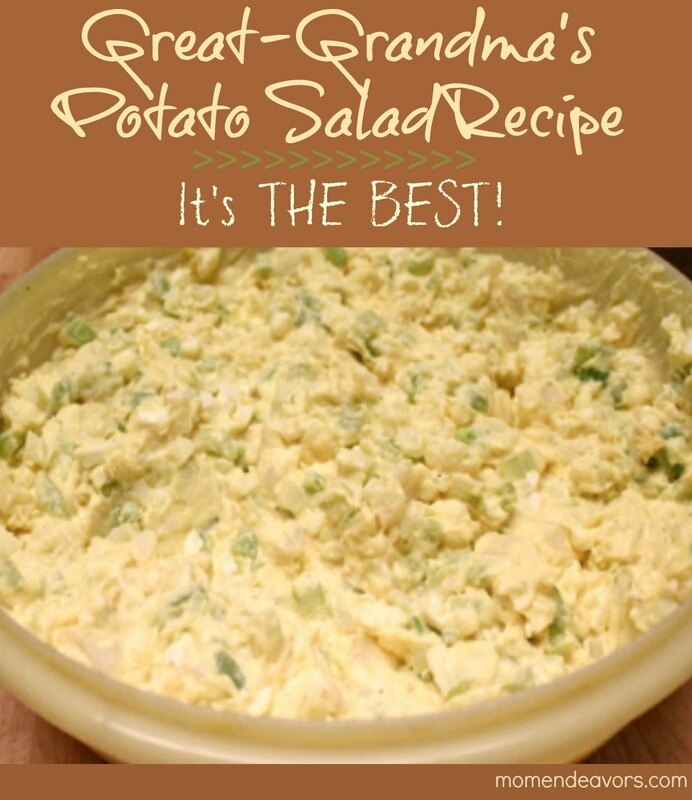 I’m excited to give this recipe a try…and thanks for the “secret” tip for the best potato salad! This is some good stuff. Definitely my go to recipe for potato salad. I like to add olives to mine. Great recipe. I leave out the celery but add celery salt. I also dice up dill pickle for a bit of a crunch and add bit of pickle juice….yummo.